Archosauromorpha (Greek for "ruling lizard forms") is an infraclass of diapsid reptiles that first appeared during the late Permian and became more common during the Triassic. It was defined by Jacques Gauthier, Arnold G. Kluge and Timothy Rowe (1988) as the group containing "archosaurs [i.e. Crocodylia, dinosaurs, birds, and several extinct orders] and all other saurians that are closer to archosaurs (s.s.) than they are to lepidosaurs (s.s.)" [i.e. tuataras, lizards, and snakes]. In a later publication, Michel Laurin (1991) defined Archosauromorpha as the clade containing the most recent common ancestor of Prolacerta, Trilophosaurus, Hyperodapedon and archosaurs and all its descendants; David Dilkes (1998) formulated a more inclusive definition of Archosauromorpha, defining it as the clade containing Protorosaurus and all other saurians that are more closely related to Protorosaurus than to Lepidosauria. Included in this infraclass are the groups Rhynchosauria, Trilophosauridae, Prolacertiformes and Archosauriformes. 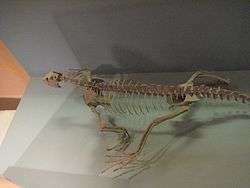 While superficially these reptiles vary in appearance (at one time they were even included in different subclasses – the trilophosaurs were considered euryapsids and the rhynchosaurs were considered lepidosaurs and were included in the same order as the tuatara), they are actually united by a number of small skeletal and skull-related details that suggest they form a clade that descended from a single common ancestor. Additional groups with uncertain phylogenetic position that are included in Archosauromorpha by some authors (and excluded from it by others) are Choristodera, drepanosaurs, thalattosaurs, ichthyopterygians, sauropterygians and turtles. Of the taxa mentioned above, rhynchosaurs, trilophosaurs and prolacertiforms died out at or before the end-Triassic extinction. The choristoderans continued as a minor group until the Miocene, and the Archosauriformes were important factors in early Triassic environments before giving rise to the even more successful Archosauria. The cladogram shown below follows the most likely result found by an analysis of turtle relationships using both fossil and genetic evidence by M.S. Lee, in 2013. The following cladogram is based on a large analysis of archosauriforms published by M.D. Ezcurra in 2016. ↑ Ezcurra, M. N. D.; Scheyer, T. M.; Butler, R. J. (2014). "The Origin and Early Evolution of Sauria: Reassessing the Permian Saurian Fossil Record and the Timing of the Crocodile-Lizard Divergence". PLoS ONE. 9 (2): e89165. doi:10.1371/journal.pone.0089165. ↑ Jacques Gauthier; Arnold G. Kluge; Timothy Rowe (1988). "Amniote phylogeny and the importance of fossils". Cladistics. 4 (2): 105–209. doi:10.1111/j.1096-0031.1988.tb00514.x. ↑ Michel Laurin (1991). "The osteology of a Lower permian eosuchian from Texas and a review of diapsid phylogeny". Zoological Journal of the Linnean Society. 101 (1): 59–95. doi:10.1111/j.1096-3642.1991.tb00886.x. 1 2 David M. Dilkes (1998). "The Early Triassic rhynchosaur Mesosuchus browni and the interrelationships of basal archosauromorph reptiles". Philosophical Transactions of the Royal Society of London, Series B. 353 (1368): 501–541. doi:10.1098/rstb.1998.0225. ↑ John W. Merck (1997). "A phylogenetic analysis of the euryapsid reptiles". Journal of Vertebrate Paleontology. 17 (Supplement to 3): 65A. doi:10.1080/02724634.1997.10011028. ↑ Sean Modesto; Robert Reisz; Diane Scott (2011). "A neodiapsid reptile from the Lower Permian of Oklahoma". Society of Vertebrate Paleontology 71st Annual Meeting Program and Abstracts: 160. ↑ Bhart-Anjan S. Bhullar; Gabe S. Bever (2009). "An archosaur-like laterosphenoid in early turtles (Reptilia: Pantestudines)" (PDF). Breviora. 518: 1–11. doi:10.3099/0006-9698-518.1.1. ↑ Lee, M. S. Y. (2013). "Turtle origins: Insights from phylogenetic retrofitting and molecular scaffolds". Journal of Evolutionary Biology. 26 (12): 2729. doi:10.1111/jeb.12268.